Education has never been more accessible, than in the 21st century. Today, anyone with enough skill and knowledge can become an eLearning content producer, and share their educational videos on the Internet. Adobe's software products are known for their remarkable performances and Adobe Presenter is no exception in this regard. The application works as an add-on for Microsoft PowerPoint and it enables teachers and educators to create professional video presentations, as well as interactive content such quizzes or surveys. In this article, we are going to take you through each step of the process of recording a video presentation in Microsoft PowerPoint using Adobe Presenter. In order to start capturing video presentations with Adobe Presenter, you must first download it from the Adobe's website. Keep in mind that this software allows you to capture footage from just one screen, and that recording presentations from multiple screens is not yet on the list of features Adobe Presenter provides. After you've installed the Adobe Presenter on your computer, you should launch the Microsoft PowerPoint. 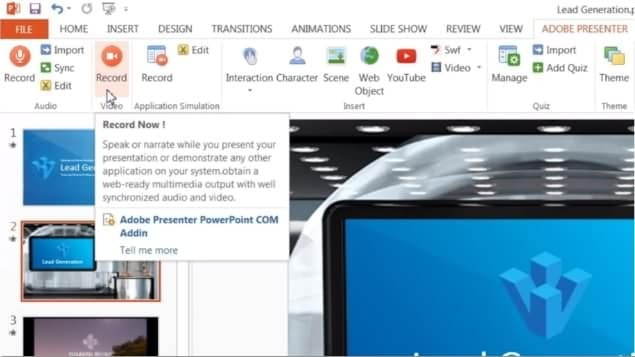 The Adobe Presenter menu should be visible on the PowerPoint's ribbon. Clicking on it will enable you to gain access to the tools that will enable you to adjust the settings for the video recording you're about to make. The slides of your presentation should be displayed in full-screen mode, and after you make sure that they are, you should proceed to click on the Record button in the Adobe Presenter ribbon. Clicking on the Record button will launch the Adobe Presenter Express and you will be asked to choose between Webcam, Screen and Both options. Which option you'll choose depends on what type of video you want to create. The Webcam option records only the footage from the computer's webcam, while the Screen option captures the on-screen activities. The Both option enables you to combine Webcam and Screen recordings in a single video. All projects you were working on recently, will be displayed in the Recent Projects menu, that is located directly below the video recording options. Clicking on the four-square icon in the Recent Projects menu enables you to import existing projects into the Adobe Presenter. In the New Project window, you'll be able to easily select the camera and microphone by clicking on their icons at the bottom of the screen. If you would like to add narration to your video presentation you should use an external microphone to ensure that the audio quality meets the highest standards. The Adobe Presenter always captures videos in HD quality, but if your computer doesn't provide support for this video resolution, the software will automatically adjust the size of the video to the highest video resolution your computer can capture. Click on the Play icon to start recording. Regardless of the recording mode you've selected, the session will start after three seconds. If you are recording in the Both mode, you will be able to capture the webcam feed as well as the computer's screen. 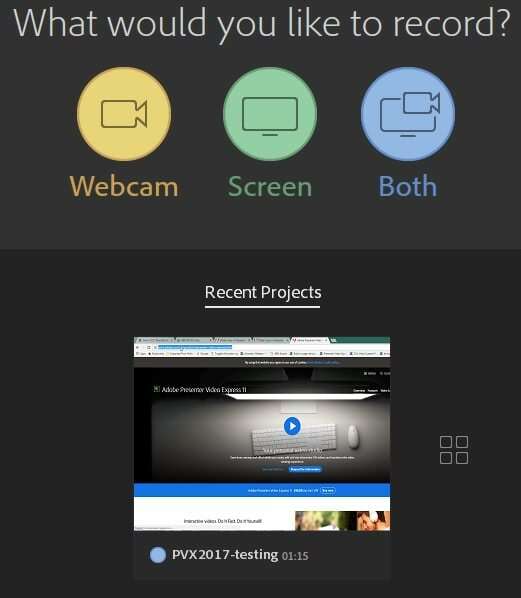 Adobe Presenter allows you to place the webcam window on the left or right side of the screen, you can easily accomplish this by clicking on the blue Both icon. During the recording session, you can pause the recording and you can resume the session whenever you want. Clicking on the Done icon will enable you to conclude the video recording session. The Adobe Presenter is fast, powerful and so easy to use that literally anyone can learn how to make video presentations in a short period of time. We'd love to hear all about your favorite software for creation of video presentations, so feel free to share your opinions in the comments.